Have you ever felt like your company’s messaging has a significant gap – especially in terms of reaching your global audience, geographically dispersed teams, ethnically diverse user groups, or differently abled employees and customers? Many contemporary global business leaders are met with a challenge to scale communication, training, learning and collaborative efforts across dispersed teams. To resolve this, a large number of organizations today are using video to bridge the gap between the top management and dispersed employees, personalize communication, and standardize training and learning efforts across the organization – all while conserving costs and time. However, to effectively reach a wide employee or user base, any business video messaging needs to have specific features and capabilities that increase its efficiency, precision, and accessibility to a large and diverse audience. For instance, a corporate communication video recorded in English for your American employees may offer little to no comprehension or understanding for employees in your global offices in Europe, India or even Latin America. The presence of a language barrier will prevent your messages from having the desired impact. The same applies to training, learning or even knowledge sharing videos where effective communication and understanding is key to any fruitful outcome for the business or employees. In the case of sales and marketing videos, the stakes are even higher. If you cannot reach your customers with a message that they relate to or even understand then it is highly unlikely that you will be able to expand into those markets. Sometimes, even if your audience speaks or understands the dominant language medium, it is useful to localize your messages to their liking or preferred language to have a greater impact as well as to show that you care for diverse employee needs. The same applies to customers or other external business stakeholder groups. Another important need for making business videos more accessible is for your video users with disabilities or physical impairments that prevent them from making full use of your videos unless it is supported by subtitles or transcribed text files. For this, your business videos need certain essential capabilities that make them accessible and understandable to all your audience, regardless of their socio-cultural backgrounds or any physical limitations. For most companies, the solution is a very time intensive and cost prohibitive one, i.e., they rely on manual transcription and closed captioning for all their videos, or they create multiple versions of the same video in different languages, depending on their user requirement. However, such manual processes not only require many disparate resources as well as a high cost and time expenditure but are also impractical in the case of growing video use in the organization. As business video consumption reaches unprecedented heights in the enterprise, it will be impossible to accomplish such tasks manually. What then is a fastest and more cost-effective solution? A video platform such as VIDIZMO that not only streams, stores, manages, and distributes your videos but also allows you to transcribe all your videos, translate them in the required languages in a multilingual application, and enable video search in the viewer’s preferred language – all in a highly integrated and comprehensive platform. VIDIZMO takes any given video and automatically transcribes its audio to text to produce a transcript of the entire audio/ video for the viewer’s reference. Viewers have the option to play the transcript directly alongside the video playback. The transcript is also editable for achieving greater accuracy (discussed later). All transcribed videos are also automatically assigned subtitles or closed captions that play on-screen, so each video is supported by the display text of all the spoken words in every video. 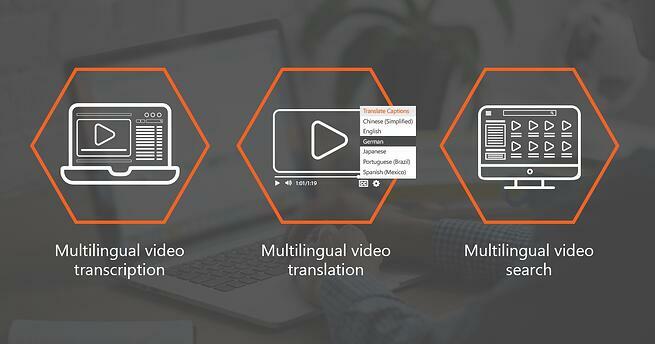 As a multilingual software, VIDIZMO then takes the transcribed text and automatically translates it to different languages so the user can view the transcript or the on-screen closed captions in the language of their choice. VIDIZMO can also translate speech into various languages, so your videos recorded in one language will be available with translated audio in other languages. VIDIZMO enables your users to search the platform for video in the language of their choice, i.e. they can search for videos across the library or search for content inside videos in the language of choosing which speeds up search while also increasing search relevancy. VIDIZMO supports a broad range of commonly used languages for transcription and translation, including English (American and British), French, German, Italian, Spanish (Spain and Mexican), Chinese (Mandarin), Japanese, Portuguese, and Arabic, and Russian. With this, VIDIZMO can automatically transcribe and translate your videos to these languages, both in terms of translating the transcribed text and translating the audio. A video platform has become an indispensable business tool for companies using video for a variety of core corporate activities such as internal and external communication, training and learning, or even sales and marketing. Why does your organization need a video platform? Well, because video content is difficult to manage. Video content not only takes up large amounts of storage capacity but it also requires compatibility with different file formats, players, and browsers to ensure a smooth playback experience while also posing streaming challenges due to bandwidth and network constraints, especially for companies with a large and diverse user base spread across the globe. Moreover, with YouTube having evolved video consumption habits across the board, corporations are increasingly feeling the need to adapt their business video to provide the same user-friendly video experience as YouTube – something only video platforms can cater. Additionally, with growing video use, it has become increasingly vital for organizations to adopt advanced artificial intelligence video technologies to utilize video optimally in a time and cost-efficient manner. VIDIZMO’s automatic machine transcription and closed captioning as well as automatic audio and text translation are both examples of such smart technologies that boost video effectiveness for a wide range of user groups. For your users, your business videos are only beneficial if they can access and understand them. To achieve this, VIDIZMO’s automatic video transcription and translation become extremely important factors in making your business videos available and accessible to all your global employees in any language to ensure that all your global employees or customers will be able to access, understand and benefit from your videos. Massively increase time and costs efficiencies with automatic video transcription and translation, which would otherwise need to be done manually or assigned to third-party service providers – incurring long turnaround times and exorbitant costs. Reach your global employees with videos in their local languages, so they get to view the videos (audio or subtitles) in their preferred language, helping increase comprehension and understanding of the content. Empower your employees or users to search for videos with a powerful search of video across VIDIZMO library as well as the spoken words inside a video – all in the language of their choice – which in turn increases search relevancy while reducing search times. Improve overall video content accessibility and understanding not only for employees with language barriers but also for your employees with any vision, hearing or other physical disabilities for which they require subtitles to simply access the videos. Reduce the time it takes to deliver your video content to your users. For instance, with automatic transcription or subtitle translation, you no longer need to wait days to make the content available to certain segments of your employee base. Maintain compliance with several industry regulations that require all videos be supported by transcripts and subtitles to ensure high content accessibility to all segments of an audience. Use one integrated multilingual video platform for all video capture, storage, management, transcription, translation, and search. In addition to this, VIDIZMO’s video portal is an entirely customizable multilingual platform, which means you can adapt the entire solution in any language (from a broad range of language choices mentioned earlier). With a highly innovative streaming video solution, VIDIZMO offers state-of-the-art multilingual video transcription, translation and search technologies enabled by artificial intelligence. We do this in the most cost-effective manner by utilizing Microsoft Azure cognitive services, and incorporating these AI technologies in VIDIZMO to provide you the latest, most cutting-edge video services to fulfill all your enterprise video needs. This way, we are able provide you the best video intelligence at the most cost efficient rate available in the industry. Other players in the video platform market, for instance, provide video transcription for $1 a minute, another $1 for closed captioning, and 10 cents per work for translating your videos to another language. By this measure, one 10-minute video would cost $20 for transcription and closed captioning and a staggering $100- $200 (depending on the number of spoken words) for translation. Video platforms that utilize third-party services from 3playmedia also follow an even more costly pricing model with English captioning and transcription for $3 per minute of video and $4.5 per minute for transcription and captioning in Spanish. Not only this but such services also have a very long turnaround time with a standard of four business days and expedited services ranging between 2 business days and 2 hours with additional per minute cost from $0.75 for two days to a hefty $5.5 additional cost/ per minute for 2 hours. VIDIZMO also offers very reasonable text translation pricing and speech translation pricing in technology not available to majority player in the streaming video domain. What about transcription and translation accuracy? VIDIZMO’s transcription offers varying level of accuracy, ranging from 80-90% accuracy for studio quality videos and lower accuracy levels for videos with a great deal of background noise, industry jargon or buzzwords, or multiple speakers with overlapping voices. However, with some customizations, VIDIZMO’s machine learning transcription software can be taught a set of frequently repeated vocabulary or industry-specific terms to increase transcription accuracy over time. Moreover, the accuracy of transcription will increase progressively as the technology becomes more advanced and sophisticated. Because VIDIZMO utilizes Microsoft Azure AI technologies, the quality and accuracy of VIDIZMO’s transcription will increase as Microsoft Azure keeps updating the quality of its automatic speech recognition and indexer technologies. Direct editing of transcript files in a side panel that appears alongside the video playback. Crowdsource the editing process by granting permissions to a set of editors so anyone can make necessary edits to the transcription on the go. Outsource editing to VIDIZMO’s transcription editors for a combination of automatic and human-reviewed transcription. Any changes made in the transcription will also reflect in the subtitles or closed captioning files. Accordingly, the changes are also reflected in any translated transcripts or audio. The accuracy of automatic text/ speech translation varies depending on the languages and can be relatively low accuracy for some languages because this AI technology is still in its nascency. However, both smart speech and text translation technology is developing fast its accuracy with improve significantly over time as the technology evolves in quality and precision. To discuss your business needs, contact us today to find out how VIDIZMO can help you execute your business video strategy with the best video technologies.